Wood Borers: These insects' worm-like larvae develop beneath the bark or within the wood leaving tunnels as evidence; emerging adults leave holes in the bark. Piercing-Sucking Insects: These insects feed on fluids of the host plant. Many spend a significant part of their lives attached to the host plant. Defoliators: These insects consume the foliage of host plants. The two featured here do their damage as larvae. Disease: The disease featured here had devastating effects in parts of the Western United States and has a broad host range. Firewood: Burn it where you buy it! Our native trees and forests are being threatened by invasive insects and diseases that live in dead and dying wood. In many cases, these pests are being accidentally spread to new locations by homeowners and recreationists moving firewood from one location to another. Firewood ALERT! 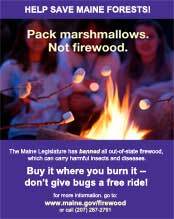 The Maine Legislature has banned all out-of-state firewood! How can firewood movement affect your forest, home and life? Browse this page for more information. Nearest Known Occurrences: Maine; Edmundston, NB; New Hampshire, Northeastern Massachusetts (Where else is EAB?). Description: Metallic green beetle with wings and body tapered towards the rear. Signs and Symptoms: Symptoms and signs include D-shaped adult exit holes, bark splitting, serpentine frass-filled (sawdust-like waste) feeding galleries, wood pecker feeding, crown dieback, and epicormic shoots (whips growing off the trunk and branches). Many of these symptoms and signs are similar to other insects and diseases of ash. Is it EAB? Damage: Larval feeding under the bark girdles and kills ash trees. Since its discovery in the United States in 2002 emerald ash borer has killed millions of ash trees. Biosurveillance: Biosurveillance uses one living organism to monitor for another. A native non-stinging wasp, Cerceris fumipennis, is a efficient survey tool for detecting emerald ash borer. Purple Traps: Large, purple, sticky traps are hung in ash trees to help look for the emerald ash borer. Hosts: Hardwood trees, especially maples. 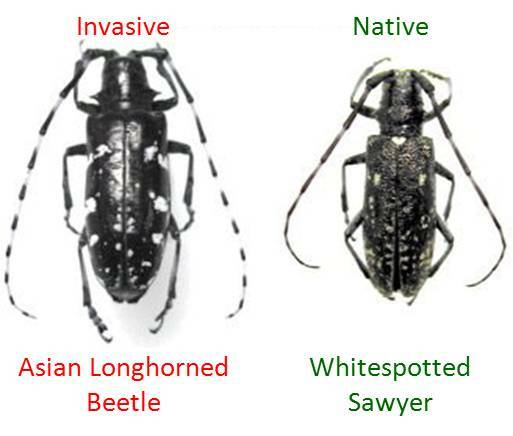 Nearest Known Occurrences: The Asian longhorned beetle has been detected in Worcester and Boston Massachusetts (More Information). New York City area in New York and adjacent areas in New Jersey. Description: Glossy black (think patent leather), very smooth beetle with white spots on the wings. Antennae are at least the length of the body and banded with black and white (how to tell Asian longhorned beetle from whitespotted sawyer). The Nature Conservancy Video: Worcester, MA landscapes before and after tree removal (Quicktime | 812 KB, new window will open). Nearest Known Occurrences: Nova Scotia, Canada. Description: Flattened brown beetle, very similar to native long-horned beetles. Reddish-brown antennae ½ length of body. Signs and Symptoms: Crown decline. Oval to round holes in bark, resin streams down the stem. Coarse sawdust at the base of the tree, on the stem and/or packed into the holes. Flattened, meandering larval feeding tunnels under the bark. L-shaped pupation chamber in the sapwood. Damage: This beetle generally attacks unhealthy trees in its native environment. In Nova Scotia it has been found to attack and kill healthy trees. Nearest Known Occurrences: Lamoille County, Vermont, also found in eastern New York and northern Pennsylvania. Description: Dark metallic blue wasp-like, robust insect without a defined waist, with a spear-shaped plate at the tail end. Reddish yellow legs with black feet. Damage: Wilted foliage eventually turning from dark green, to light green, to yellow and then red. Resin beads and flows sometimes found at egg laying sites (not found with our native pine borers). Amylostereum areolatum, the symbiotic fungus of Sirex noctilio, has been detected from southern Ontario, Canada. 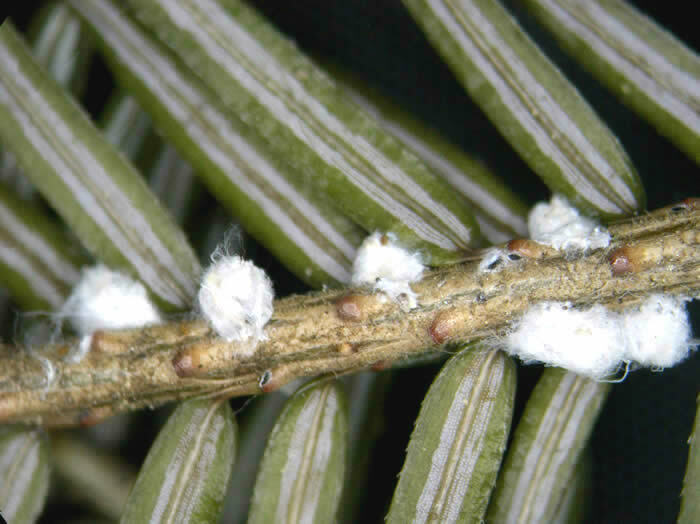 Nearest Known Occurrences: ** Hemlock woolly adelgid is known to be established in southern coastal Maine east to Lincoln County. Description: A small aphid-like insect covered with white, waxy wool-like material. This wool-like covering makes the insect resemble miniature cotton balls. It is most visible from late-October through July. Wool masses are located on the undersides of the twigs at the bases of the needles (not on the needle, but on the twig). Signs and Symptoms: The white waxy cotton ball-like covering of this adelgid is the most obvious sign of this insect. Damage: Feeding by the adelgid leads to needle loss, crown thinning and dieback and eventual mortality of trees. Decline may be more rapid in the presence of elongate hemlock scale (described below). Hosts: Hemlock, spruce, fir = primary hosts. Secondary coniferous hosts only usually infested in the presence of heavy scale populations on primary hosts. Nearest Known Occurrences: To date EHS has been found on planted hemlocks in southern Maine and in the forest in Kittery Point, ME. Description: A member of the armored scale insects, females are covered by a smooth, yellow-brown parallel-sided waxy covering, males by an white, elongate covering. Size ranges from 0.1mm to 2mm. Signs and Symptoms: Mottled, yellowing needles, thinning foliage. Coverings of females and males (described above) and thread-like floss. Where to look: Planted hemlock, spruce and fir. Planted and natural hemlock in areas affected by hemlock woolly adelgid. 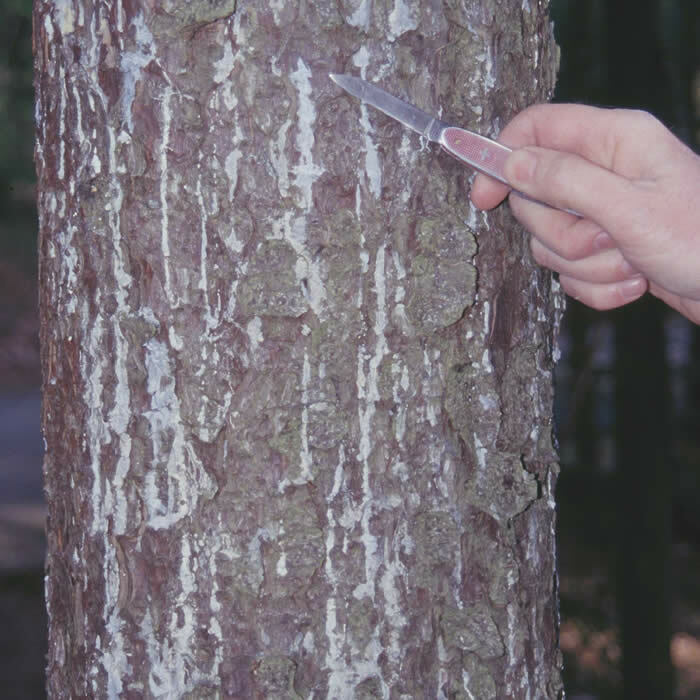 Hosts: Red pine scale is known to infest red pine (Pinus resinosa), Japanese red pine (P. densiflora), Japanese black pine (P. thunbergii) and Chinese pine (P tabulaeformis). Nearest Known Occurrences: Red pine scale was detected in Mount Desert, Hancock County, Maine in September 2014. This is the first known occurrence in Maine. It is found throughout southern New England, New York, New Jersey and eastern Pennsylvania. Description: Red pine scale is one of the Matsucoccus scales, a soft scale. Most recognizable stages of the insect are covered in white, waxy, wool like material. The sub-adult males spin capsule-shaped, loosely woven cocoons which can be found on the branches of affected trees. The females create wispy, woolly ovisacs. When the immature insect is settled on the tree it resembles a smooth, waxy pod, lacking antennae and legs, but adorned with sparse tufts of wool. Signs and Symptoms: Off-colored needles progressing from olive-green, to yellow, to red—first on individual branches, then whole trees. White wool-covered insects (as described above). Damage: needle, branch and whole tree mortality. Nearest Known Occurrences: Winter moth is known to be established in several towns in Coastal Maine, and may be more widespread. Defoliation by this pest was first noted in May 2012. It has spread fairly rapidly through the eastern half of Massachusetts and into Rhode Island and Connecticut. Description: Larva is a pale green inchworm caterpillar. Adult males (photo right) are delicate tan moths, part of the "hunters moth" group (seen in late fall and early winter). Adult females (photo left) have vestigial wings, but cannot fly, they are most easily found by investigating the focus of male moth activity (other than your lights). Winter moth is very closely related to a native moth, the Bruce spanworm (Operophtera bruceata), dissection or DNA analysis are usually required to tell adult males apart. Damage: Defoliation leads to loss of capacity to produce energy. 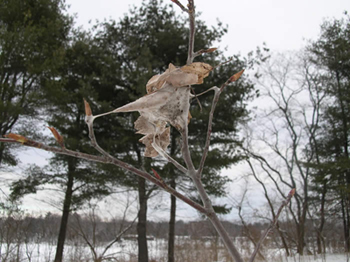 Severe defoliation over several years can cause tree mortality, as has been the case in Massachusetts in recent years. Human Aided Spread: Winter moths pupate in the ground and can be moved in soil from late May through December. Caterpillars can be accidentally spread on and in cars, boats and other conveyances. Where in Maine might I expect defoliation by winter moth? Nearest Known Occurrences: Browntail moth is known to be established in Southern and Coastal Maine and Cape Cod Massachusetts. Description: Large larvae, about 1 1/2 inches long, are dark brown and have a broken white stripe on each side of the body and conspicuous, unpaired, reddish spots on the posterior end of the back. is dark brown and hairy, with parallel white markings running down the back. Reddish spots will be apparent in early instars as well. Signs and Symptoms: Feeding by the browntail moth will vary with the season. Larvae overwinter, so feeding begins early in the spring, damage is visible as the leaves unfurl. As the larvae grow the consume larger and larger chunks of the leaves, and can completely defoliate host trees. Affected trees usually refoliate within the same season. After the overwintering larvae hatch in the summer, they will skeletonize leaves, and tie them with silk to the host branches. Winter webs on the outside edges of host crowns are conspicuous, tightly woven clusters of skeletonized leaves silk and sometimes fruit, filled with tiny larvae and frass. Winter web abundance can be a good barometer of summer suffering. Damage: Although browntail moth is a forest pest, and can cause mortality of host trees, the biggest impacts are on human health and economics. Exposure to irritating hairs can cause a wide range of symptoms, from mild to very severe. See our fact sheets for more information. Nearest Known Occurrences: Canker damage occurs in California and Oregon. The disease causing organism, Phytophthora ramorum, was found on one potted lilac plant in Maine, but it is not believed to be established in Maine. Surveys of four forested watersheds in central and southern Maine were conducted during 2007, with no P. ramorum found at any location. 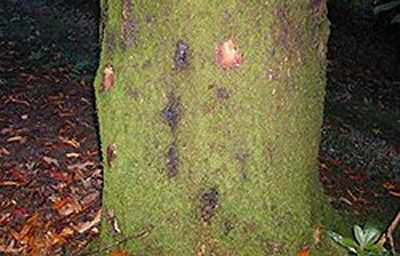 Description: The causal agent of sudden oak death is a fungus-like micro-organism called Phytophthora ramorum. Laboratory tests are necessary to confirm this species as the cause of disease. Signs and Symptoms: P. ramorum causes two types of symptoms. In "bark canker" hosts, such as oaks, large cankers can be found on the trunk or main stem. Crown browning will also occur. 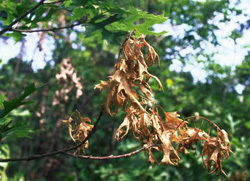 In "foliar hosts", leaf blight (gray to brown lesions) and twig dieback may be found. Damage: This disease has caused mortality of oaks and tanoaks in parts of the western United States (bark canker hosts). Foliar hosts may serve as a reservoir for disease inoculum. Hosts:Oaks; symptoms are more severe on species in the red oak group (oaks with pointed leaf tips). Nearest Known Occurrences: Tree damage and mortality by the causal fungus, Ceratocystis fagacearum, has been confirmed in three location on Long Island, New York, one location in eastern and one in western New York State. Oak wilt has not been detected in Maine. Description: The disease causes wilting symptoms leading to mortality and is vectored (spread) by sap-feeding beetles that are attracted to wound areas and oak twig-boring beetles. Both beetles carry spores from infected to healthy trees. Once oak wilt is established in a stand of trees it spreads below ground through tree root grafts (junctions where adjacent trees join their root systems). Signs and Symptoms: The causal agent of oak wilt kills the xylem tissues leading to wilting and killing of branches (flagging). As the disease progresses in the tree, wilting and branch mortality expands with trees dying in the same year or the next year (depending on the specific situation). When the disease is spread through the roots, the entire tree will die rapidly. The disease persists for long periods of time in white oak group oak trees (rounded leaf tips) causing noticeable but less-severe symptoms and an overall slower tree decline. 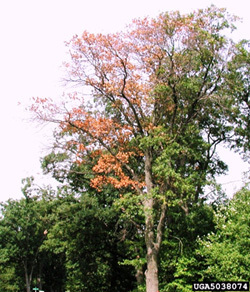 Damage: This disease has caused mortality of oaks in the Midwestern United States for decades and is a threat to oaks in natural and residential areas. Damage to oak trees via pruning or otherwise during the growing season should be strictly avoided in areas where the oak wilt pathogen is present. This is because the insect vectors of the fungus spread the disease from infected trees pruning wounds on otherwise healthy trees. Under Executive Order 13112, a species is considered invasive if it is not native to the ecosystem in question and its introduction causes or is likely to cause economic or environmental harm or harm to human health.